Brandon Adams had to be pleased to get all in holding A A . His opponent held K K was in serious trouble. The flop gave both players a set, running A 3 K . The turn was the 3 giving Adams the best possible full house, but on the river the table exploded with a collective “oooh!” as the case K fell to give quad king to the other player. After a nice start to the day, Adams was down to just 5,000 in chips. Interestingly enough, just a few hands later a player with pocket aces got all in again against a player holding pocket kings. Once again, a king fell on the flop and the aces were cracked, eliminating the player holding them. We caught up with the action on the river with the board reading 8 Q 6 8 2 . There was already over 14,000 in the pot and Jon Friedberg had put out a bet of 8,100. Friedberg sat motionless with his sunglasses on and eventually his opponent flashed A-Q and tossed it into the muck. Friedberg immediately mucked his cards and the dealer pushed him the pot. Friedberg is now up to 41,300 with the pot. We got to the action at the end of a preflop raising war between John D’Agostino and Alex Bonnin. It resulted in D’Agostino getting his last 17,000 into the middle with pocket jacks against the K 5 of Bonnin. To make a long story short, Bonnin hit a king on the flop to send D’Agostino home. Andrew Lichtenberger was checked to a flop of A J 6 . Lichtenberger fired 1,100 and was called by his opponent. The 6 fell on the turn and both players checked. The 5 was the river card and both players checked again. Lichtenberger mucked his hand when the other player turned up 8 8 , dropping him to 15,000 in chips. 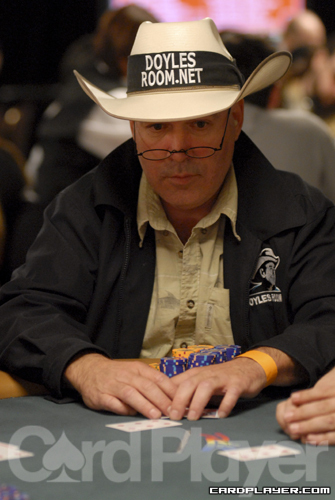 Robert Williamson got all his chips into the middle preflop with pocket queens. His all-in of just under 20,000 was called by an opponent with A-K. The flop came Q 10 5 and gave Williamson top set, but left his opponent with a gutshot. The J filled the straight draw and Williamson needed the board to pair. However, the 2 on the river sealed his fate and he was eliminated. Chris Ferguson looked down at the Q Q with a raise and call in front of him. He had just 16,000 in his stack and decided to move all in. The initial bettor called with the 4 4 and the other opponent folded. The board ran out 9 10 9 J 2 and Ferguson doubled to 41,000. Ludovic Lacay was short and move all in with the A 9 and was called by the A J of an opponent. The board ran out A 6 6 7 7 and Lacay was gone. Jon Friedberg had player with a short stack all in preflop. Friedberg exposed the A J while his opponent tabled the 8 8 . The board ran out 10 3 3 J 6 and Friedberg won the hand. He was at 72,000 after the hand. We caught up with this hand on the river with the board reading 6 A 3 6 8 and David Sands was facing a river bet of 8,500 into a pot of about 14,000. Sands tossed his hand back and forth as he counted out the chips to make the call and tried talking out what his opponent could have. Eventually Sands made the call and his opponent nodded his head and acknowledged the good call. He was reluctant to turn his hand up, but eventually showed 9 10 . Sands turned up Q Q and took the pot to climb to 210,000. Every ESPN employee in the amazon room rushed over to the table in the orange section to see Doyle Brunson all-in and behind. On a flop of 8 4 3 , Brunson got all his chips in the middle of the table with 7 7 and his opponent tabled J J . The turn was the 4 , leaving Brunson with one of the two remaining sevens in the deck to take the pot and stay alive. The river wasn’t favorable to Brunson, as the dealer peeled off the 6 to eliminate Brunson from the tournament. Brunson got a round of applause from entire room on his way out. Brunson’s series is over, and he is happy it is since Brunson did not have a single cash all summer. With the board showing 8 5 8 2 K Phil Galfond checked to seat 4 who bet 10,000. Galfond went deep into the tank, thinking over the possibilities. He finally made the call and showed just A 3 . His opponent mucked, and the very nice call gave Galfond 173,000 in chips. After multiple raises preflop, Brandon Cantu and two other players saw a flop of 5 9 4 . All players checked the flop and saw the 7 fall on the turn. There was a bet of 9,500 and Cantu called. After the 8 came on the river, Cantu faced a bet of 28,500. Cantu made the call and wasn’t happy with the results when he saw the 6 6 , giving his opponent a straight flush and the pot. Cantu is now down to just 10,000 in chips. Darvin Moon was on the button for a flop of 4 9 2 . David Hannani bet 4,100 and Moon jammed all-in for 22,875. Hanani went into the tank for a few minutes before making the call with A A and was well ahead of Moon’s 9 10 . The turn was the K and the river was the 5 , eliminating last year’s runner-up. A player in the hijack raised to 2,000 and the player in the cutoff called. Jon Friedberg raised to 7,300 from the big blind. The original raiser immediately moved all-in and had Friedberg covered. Friedberg went into the tank for a while before finally folding his hand. “I had ’em,” his opponent said as he turned over two aces. Friedberg falls to 28,000 with the loss. Rolf Slotboom raised to 1,350 on the button and both blinds called. On a flop of 5 9 4 , the big blind bet out 3,000 and Slotboom raised to 8,000. The big blind moved all-in as soon as he could and and Slotboom made the call. Slotboom made the call and showed 9 9 and was in great shape after seeing his opponent’s 5 5 . Slotboom just needed to dodge the case five to seal the win. Slotboom dodged a miracel and jumped up to 85,400. Scott Clements raised to 1,925 from the button and the player in the big blind called. The big blind checked a flop of A J A and Clements bet 1,800. The big blind made the call. The 10 hit on the turn and both players checked. On the 7 river the big blind led for 1,500. Clements looked over the board and decided to fold. Even so, he had around 80,000 following the loss. Cannatella had top pair and her opponent held a straight draw. The turn was the 9 , giving her opponent the straight and the Q river meant that Trishelle lost a large chunk of chips. Soon after, she got her last 5,500 all in holding K 6 and was called by her opponent’s A Q . The board ran out 6 5 8 3 8 and her opponent’s took the pot and eliminated Cannatella. Ryan Daut bet 2,500 on a flop of 2 3 5 and got a call from one player. The turn was the 3 and both players opted to check. The river was the J and Daut fired 5,200 and was called by his opponent. Daut mucked and his opponent showed 9 9 . Daut fell to 49,000 with the misfire. 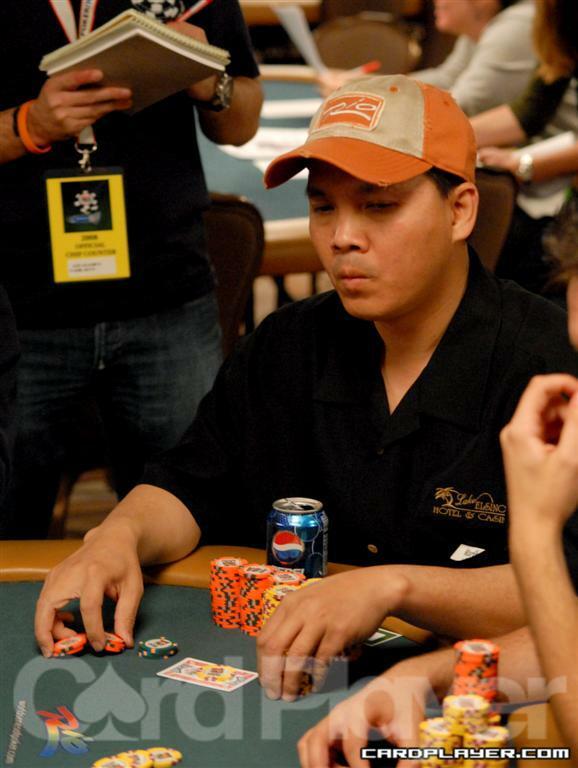 David Chiu was in the big blind and called a preflop bet. Two other players called as well. The flop came J 10 3 and it was check around. The 3 fell on the turn and and Chiu bet 3,500. One player called and the A fell on the river. Chiu checked and his opponent checked behind. Chiu tabled the 4 3 and his opponent flashed an ace. Chiu was at around 70,000 after the hand. Gabe Walls opened to 1,500 and a player moved all in for 22,900. Walls made the call with the A 7 and was behind the pocket tens of his opponent. However, the board ran out 6 2 2 A Q and gave Walls the pot. He was at 430,000 after the hand and the chip leader. After a raise in late position to 2,200, Jon Friedberg reraised all in for 11,000. After his opponent thought for a few moments, his cards hit the muck and Friedberg took the pot and incrased his stack to 15,000. Jason Wheeler raised to 2,200 from middle position and was met with a three-bet to 5,800 from Kevin Bordreau. Wheeler moved the rest of his chips in and Bordreau made the call. Wheeler showed A K and was in a classic race situation since he was against the 6 6 of Bordreau. All of drama was ended early when Bordreau flopped quads and left Wheeler drawing dead. Bordreau chipped up to 46,000 and Wheeler slipped to 14,000. A player under-the-gun raised to 2,200 and “Minneapolis” Jim Meehan called and so did the big blind. On a flop of K 5 4 , the original preflop raiser bet 1,800 and was called by Meehan. The player in the blind got out of the way and they saw the 2 fall on the turn. Now the player under-the-gun moves all in and has Meehan covered, who has 14,000 left. Meehan goes into the tank. “Sorry guys,” he said. “For you it’s nothing, but for me it’s my tournament life.” Eventually Meehan tossed his cards into the muck and will wait for a better spot to get his chips in. Justin Young and Bryan Devonshire are at the same table are are joking about how many players have been eliminated today. There were 2,601 people who started the day, and there are currently approximately 300 players left. “You could get through day 1 and be in the money on the start of day 2,” joked Young. With 110,000 in his stack, Dan Lu and his opponent got all the chips in the middle for 17,000 apiece with Lu exposing pocket fours against the sevens of his all-in opponent. The board offered no help to Lu and he was at 93,000 after than hand. Lee Markholt bet 6,000 on the button. Thomas Joanides moved in from the big blind for 1,300 more. Markholt made the easy call and tabled the J 4 while his opponent exposed the 9 8 . The board ran out K 9 2 6 4 , and Markholt lost the pot to fall to 60,000. Joanides is at 21,000. Kevin Stammen found all of his 30,800 chips in the middle preflop and showed J J . His opponent showed the A J . The board came out Q 7 Q 9 2 and Stammen doubled up to 66,000. Jordan Morgan raised in the cutoff and the player in the cutoff moved all-in for 60,000. Morgan quickly called with K K and the small blind showed Q 10 . The flop was 8 8 J ,giving the small blind a straight draw. The turn bricked but the river was the 9 filling the straight draw and sending Morgan out the door. We got to the table pretty late, but Jon Friedberg was all-in with pocket tens, but was trumped by Eric Baldwins A-Q. Jared Hamby was dealt the A A and was all in against an opponent and a third player who was very short stacked. The opponent that had both Hamby and the short stack covered held A-Q, while the short stack held Q-7. The aces held and Hamby is now at 120,000 in chips. A player raised to 600 and Jon Friedberg reraised to 1,800 behind her. Scott Seiver then moved all in for 13,000 and the original raiser folded. Freidberg called and showed pocket aces which held up against Seiver's pocket sevens. Friedberg now has 37,000 in chips. Joe Hachem was all in near the bubble with pocket kings and up against Robert Mizrachi's A-K. An ace hit the board and Hachem was eliminated just before the money. 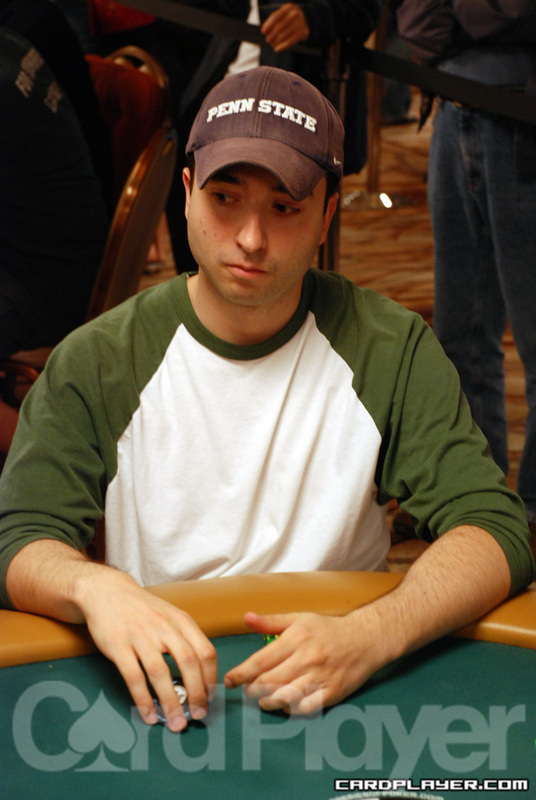 Jon Friedberg was eliminated in 102nd place, which normally triggers hand-for-hand play. Keep reading to see what happened on the bubble. After Frieberg's elimination, everyone in the room waited for hand-for-hand play to begin. As the clock continued to run, the field was alerted to a table that was still involved in a hand. The board read J 10 10 A 8 and Jason Dewitt bet 62,000. Rheem moved all in, having Dewitts remaining 263,000 covered. A crowd of about 35 formed around the table, awaiting Dewitt's decision. After about five minutes, Dewitt called and Rheem instantly turned over A A for a full house. Dewitt mucked and slowly walked away from the table, as the field of 100 celebrated their cash. After the hand, Rheem's stack ballooned to 865,000 for the chip lead. A player raised in early position to 11,000 and Phil Hellmuth called from the big blind. The flop came A A 9 and both players checked. The turn was the 6 and Hellmuth checked. His opponent bet 18,000 and Hellmuth moved in for a total of 60,000. His opponent called and showed A 8 for trip aces. Hellmuth showed 7 4 for a flush but the river was the 9 double pairing the board and giving his opponent a full house, eliminating Hellmuth. Jon Friedberg moved all in on the short stack with 10-9 and was called by the A-Q of Jack Schanbacher. The board produced a ten and a queen and Schanbacher's hand held to send Friedberg packing in 11th place. 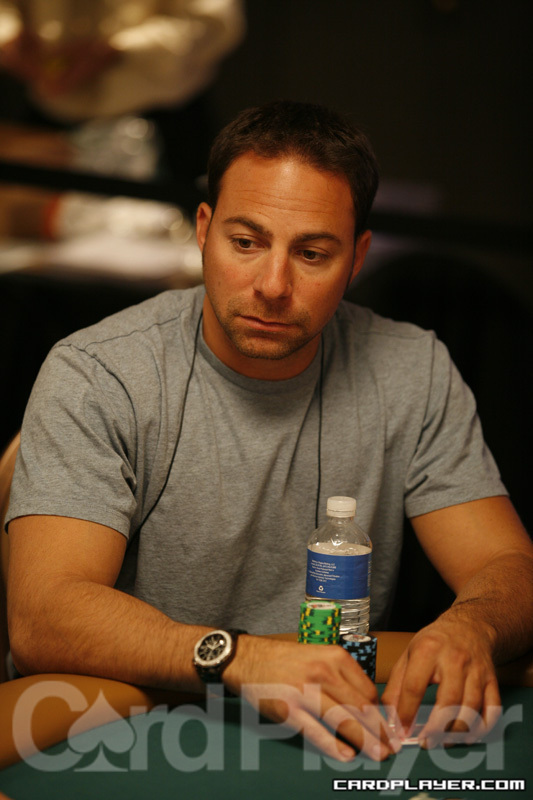 Ron Kirsh, left crippled by the earlier hand with Jon Friedberg, has been eliminated in 20th place. Jon Friedberg and Ron Kirsh get it all in preflop for a massive pot worth 1.5 million. Kirsh shows pocket kings and Friedberg one-ups him with pocket aces. The board comes 10-4-2-A-K and both players hit a set. Friedberg's is higher and he takes the chip lead with 1.5 million. Kirsh takes a massive hit and is left with 150,000. 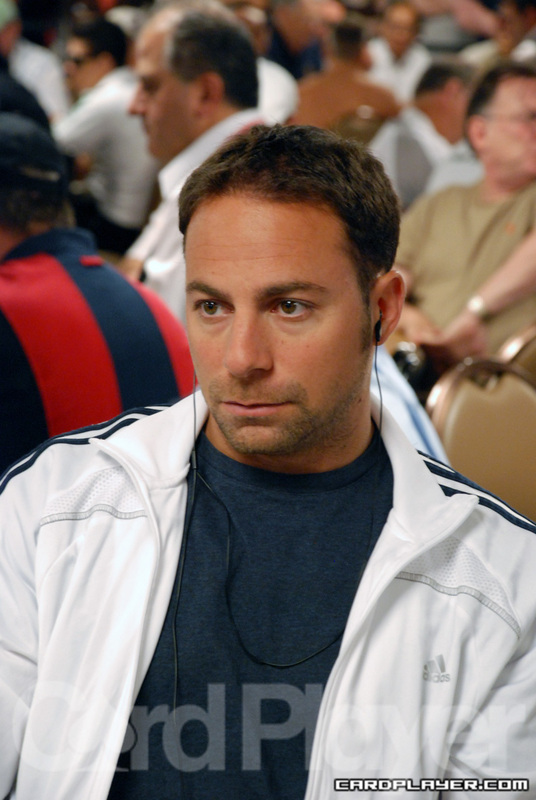 Card Player TV catches up with Jon Friedberg on break at the 2008 WPT Festa Al Lago. Note: The players are now playing hand-for-hand as we play down to the 666 players who will make the money. Action folded around to the player on the button who raised to 7,500 before the fop. Ryan Daut reraised to 27,000 from the small blind and after a minute in the tank, the player on the button made the call. The flop came Q 10 7 , and Daut led out with a 50,000 bet. The button raised all in and Daut called. Daut was outchipped and facing elimination when he turned over A A for the overpair, his opponent showed 10 10 for middle set. The turn was the K , giving Daut four more outs, but the the river was the K , putting an end to Ryan Daut's WSOP run, sending him home early with less than 50 or so players until the money. Sarkis Akopyan raised to 35,000 from middle position before the flop and Minh Nguyen repopped for over 100,000. His opponent reraised all in and Nguyen called, being covered by Akopyan. Nguyen showed K K , but Akopyan against his opponent's A A . The flop came A 9 6 , giving Akopyan top set and leaving Nguyen drawing slim. The J came on the turn and Nguyen was drawing dead. The K came on the river, as if to laugh in Nguyen's face by giving him a losing set, and Nguyen made heartbreaking exit. RIght now if there are crowds swarmed around a table, it means one of two things. It's either Phil Hellmuth's table and he's up to his usual "Poker Brat" ways. Or it's the current chip leader, Jeremiah Smith, as he knocks out yet another opponent and approaches the one million mark in chips. The most recent crowd formed for Hellmuth. He made it 9,000 to go from under the gun and a player in late position reraised to 24,000. Action folded to Hellmuth, who made it a whopping 84,000 to go. His opponent called and the the flop came Q 5 2 . Hellmuth checked and his opponent bet 60,000. Hellmuth check-raised all in and the camera crews and surrounding crowd thickened. Hellmuth began to tell Mike Matusow at a distant table about how he was all in and Matusow came over to try and see the action. After several minutes Hellmuth's opponent wiped his eyes, let out a sigh and mucked his cards. A smiling Hellmuth sat back down and collected the big pot, chipping up to 470,000. Jon Friedberg got all in preflop with Christopher Olson and one other player. The third player showed J J . Olson one-upped that player and showed Q Q , but Friedberg led both of his opponents with K K . The board came A 8 7 7 4 and Friedberg took down a huge pot worth nearly 450,000. Anthony Meeker raised to 8,500 preflop and the button re-raised 15,500 on top of that. Meeker called and the flop ran 6 5 4 . Meeker led out with a bet of 17,000 and the button re-raised to 38,000. Meeker just called and then checked the 10 on the turn. The button bet enough to put Meeker all in and was insta-called. Meeker quickly turned over 7 8 for the flopped nut straight and the button held only K J and was drawing dead. A meaningless 10 fell on the river and Meeker doubled up to around 330,000. Johnny Chan check-called his opponent's bet of 10,500 with the board showing A 7 2 . The K showed up on the turn and Chan again check-called his opponent's bet of 23,000. The river brought the 5 and Chan checked one more time. 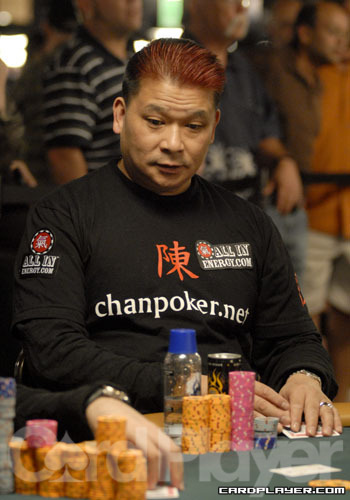 His opponent fired 58,000 and Chan made the call, showing A Q for top pair. His opponent turned over 8 8 for the losing hand. Chan was at 336,000 after the hand. Players are now going on a 20-minute break. Hoyt Corkins and Ivan Demidov exchanged a series of preflop raises until Corkins finally announced all-in for his remaining 260,000 in chips. Ivan Demidov had him covered, and had him beat with A A . Corkins held Q Q . The flop came 10 5 4 , followed by the 5 on the turn and J on the river, and Corkins was eliminated. Stephen Kenna was facing a raise to 30,000 from Joe Bishop, but didn’t hesitate while moving all-in for his final 248,000. Bishop elected to make the call and showed A J . Kenna was well ahead with A A , but he had to dodge some cards as the board played out. After a flop of 10 10 5 , the 8 on the turn provided Bishop a series of outs with a flush draw. Kenna sweated until the 2 fell on the river and doubled him up. With the board Q T 4 Q , Phil Hellmuth bet 140,000 and was called by David Saab in the cutoff position. Albert Kim folded and then the river was the 8 . Hellmuth checked and Saab bet 200,000. Hellmuth quickly folded -- he later said he held pocket nines -- and Saab flipped over K 9 . 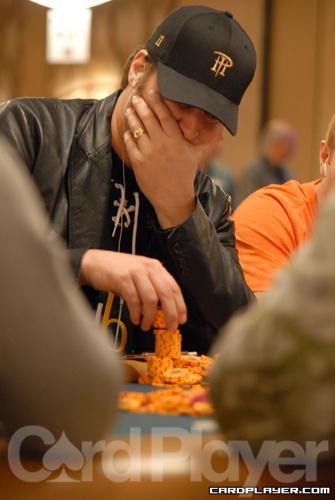 Hellmuth was especially exasperated after the hand, saying he couldn't believe how these players make it to day five. He told Saab, "I'd love to see the string of beats you put on people to make it here." 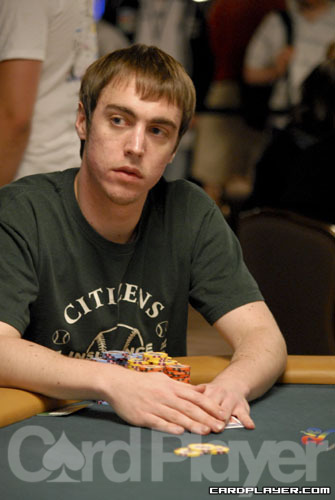 One-time Card Player employee Keith Hawkins of England raised from under the gun to 32,000 and play was folded to Jonathan Friedberg who moved all-in for his final 171,000 in chips. Hawkins elected to make the call, and found he was ahead with A Q . Friedberg held A J , and missed on the flop that came 10 7 3 . The 2 offered no help on the turn and the 9 ended his hopes of a gold bracelet.